Washington DC – IOM, the UN Migration Agency, joined the Organization of American States (OAS) and nine international institutions of the Joint Summit Working Group (JSWG) to support the implementation and follow-up of the mandates of the Summits of the Americas. 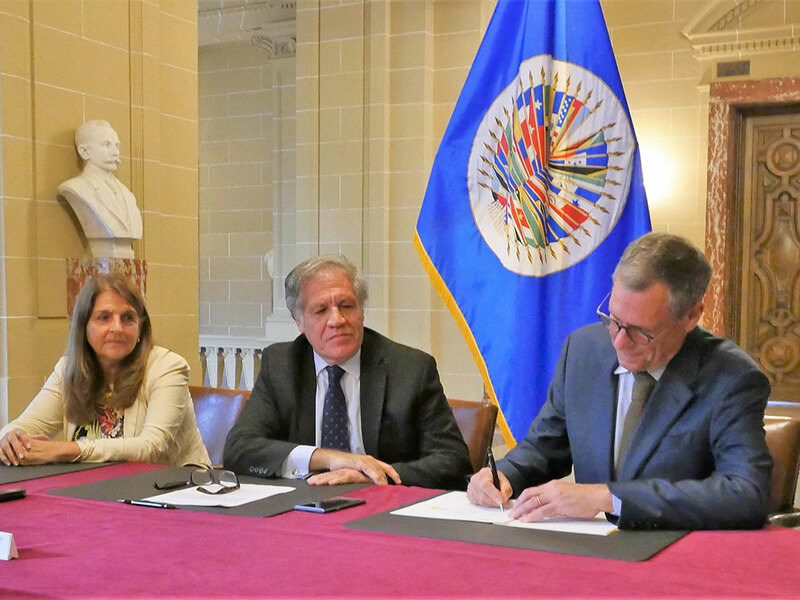 At a signing ceremony held earlier this week (04/09) at OAS Headquarters in Washington DC, IOM and the JSWG member organizations reaffirmed their commitment to put forth and consider the most salient issues facing the Americas. At the First Summit of the Americas, held in 1994, several organizations met to discuss the importance of fostering inter-American trust and cooperation between states and institutions. In that first meeting and in subsequent summits, leaders discussed common policy issues, goals and shared concerns about the most significant issues taking place in the Americas. Key sectors considered include education, health, energy, environment, migration, security, citizen participation, democratic governance and hemispheric partnership for development. At the Eighth Summit of the Americas held in Lima, Peru, in April 2018, there was a renewed focus on tackling corruption. Article 51 of the Lima Commitment calls upon the JSWG to provide resources and technical capacity-building to address corruption, including acts related to trafficking in persons and smuggling. Since migrants are especially vulnerable to trafficking, exploitation and other abuses during their journey, bolstering transparency and strengthening accountability mechanisms is necessary to ensure migration is orderly and safe. As corruption is a cross-cutting issue that directly and indirectly impacts migrants, IOM is in a unique position to share technical support with the JSWG and OAS concerning human trafficking – the world’s fastest growing crime. One potential outcome of exchanging information and best practices is that organizations will be better equipped to fight such corruption and promote democratic governance. The memorandum of understanding signed this week focuses on increasing technical coordination and information sharing to more effectively pursue the mandates of the Summits. IOM remains deeply committed to the goals of the Summits and will uphold its commitment to combating corruption in the region. In addition to OAS and IOM, the other signatories include the Inter-American Development Bank, Economic Commission for Latin America and the Caribbean, Pan American Health Organization, International Bank for Reconstruction and Development, Inter American Institute for Cooperation on Agriculture, Central American Bank for Economic Integration, Corporación Andina de Fomento, International Labour Organization and the United Nations Development Programme.